The SECRET Behind Video Testimonials? Video Testimonials – the perfect tool to portray your unique story to your potential clients. However, you should remember that if you do tough self-promotion in video testimonials, people will not trust you and might refuse to buy your service or products. Oftentimes people promote themselves far beyond what is needed and scare off or annoy potential clients. However, real recommendations that clients give you that consist of a strong experience with your product will be very useful. Video testimonials – the perfect environment for exchanging experiences with clients. Video testimonials should consist of unique experiences and the capabilities of your business. If you want to know more about effective video tools for your business that could bring you more leads and new costumers (sales), go to this link and fill the web form. You will get weekly updates in your mailbox instantly. Know more about valuable tools! How can you quickly get video testimonials from your clients? 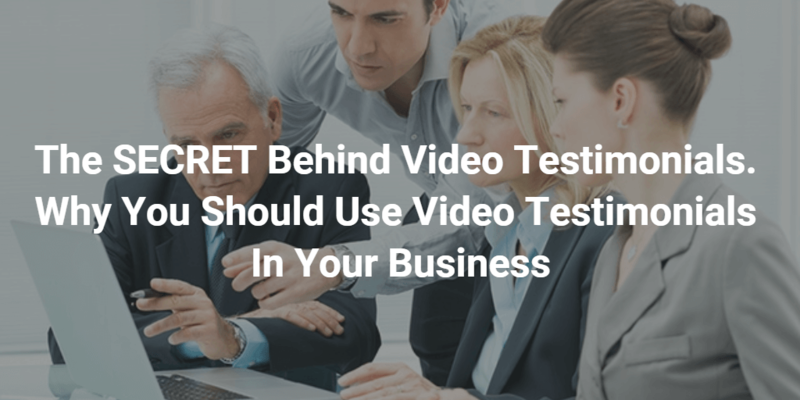 Most people are hesitant to gather video testimonials. However, the fact is that you can easily find a few positive recommendations. You do not need a thousand testimonials. You need few good quality testimonials. Robi Mitchel from the online Math Readiness course made such good video testimonials that they will never have to shoot them again! It is very simple procedure. During the lessons, they get few students from class to share their good experiences they have had while working with them. For example, John Mater from company Redtail Solution, took testimonials from trade shows. He asked clients to give him a few recommendations for different products. He was shocked how people were motivated to give some good quality feedback on camera. Do not be afraid to contact to people, you should get at least three quality recommendations. They will be very valuable material on your site or cd. Your future client will say thank you for them! Should you write the script for your video testimonials? You should prepare q list of simple questions, if they are thinking about marketing in the video, their voice will be like a robot and their body will be tense. All of this will make the video seem forced and unnatural. One of the most effective ways that you could use is to prepare some key points regarding the usefulness of your company (Redtail Solution). If people love your product, they will easily read these key point and give you the best video testimonials that you could ever get! They will talk about the benefits of your products and they will be using their own words, not someone else’s. This is the most valuable aspect in a video testimonial. When students from the online Math Readiness course gave some good testimonials about math, they do not have any script, they had only list of questions that they knew very well. The most valuable testimonials are when they are shooting from working place. For example, you could get one employee from working place and he will talk honestly with you. You should do this consistently in your working place; you will get good recommendations that are authentic and 100% believable on 100%. The easiest way is to shoot at a trade event because all of your clients will be located in one place. However, this type of video testimonial is not the best because sound and picture quality is not as good. You should remember that sound plays a big role in video testimonials, so you should always have a good microphone and recorder. In addition, you should remember that all people are nervous in front of a camera. They are thinking about one thousand problems and questions: “how fast I should read this text,” “how is my voice,” etc. You should continue to talk and ask more questions. People will open up to you and when they open up they are talking with emotion! In this moment, you should understand that this is the best recommendation! If something is going wrong in an interview, you should go on. When people open up to you, they will give the most emotional and valuable video testimonials that you have ever heard! This is the trickiest part, because to get this emotional testimonial you need to be very inspective. Where you can put these awesome testimonials? You can put these video recommendations on your website. The right place to put this video is nearby your product. People could easily read about your product and watch superb testimonials of previous clients that have already use your stuff. Please do not forget to use statistics from YouTube and Vimeo to find what is working and is not for your testimonials. 1. Ask people to leave you video testimonials. 2. Before an interview, you should give your clients ideas about what will be next. However, you should not to ask them specific questions. 3. Shoot the testimonials in the working place of your client. 4. In the interview, you should focus on chatting with your clients. You should always cut unnecessary things from video testimonials. 5. You should use video testimonials on your website; it will give you a big stock of trust and it will be a good motivational mechanism for you customer feedback. 6. Always use analytics in your videos. In this article we show the best solution that you can find in the market about video testimonials, and today you can order production for video testimonials for your business. Using these testimonials you will definitely get more leads and sales! Go here for the consultation about cartoon ads.